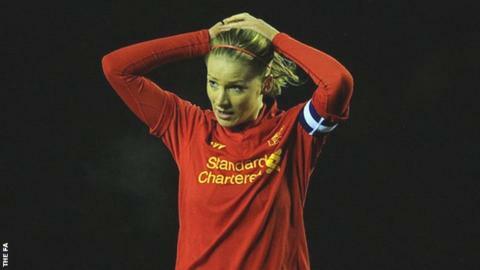 Liverpool are not concerned about their lowly Women's Super League One position, insists captain Gemma Bonner. The reigning champions are currently sixth in the table, five points above bottom side Bristol Academy, who they host on Saturday. With just five league games remaining, the relegation-threatened sides face each other twice, with their last meeting on the final day of the season. "I wouldn't say we're panicking, we're winners in this team," Bonner said. "It's quite tight both at the top and the bottom and there's not much between the teams. "It's probably unusual for most of us being in this position and you've got to get through these phases, but there's still games to play. "There's still lots of points to play for so we are looking to finish as high up as we can." Liverpool, who start their Champions League campaign against Brescia in October, have not won in the league since 12 July but Bonner insists their 100 % recordin this year's Continental Tyres Cup has given the team plenty of confidence. Even though the Reds are 10 points adrift of leaders Chelsea, Bonner says they will still have a part to play in the title race. "We're taking each game and we're going to look to win as many as possible," Bonner told BBC Sport. "We're definitely not giving up the title fight easy but a lot of teams are ahead of us now so we're looking to finish as high up the table as we can. But we've got to concentrate on picking up the points first." Since the mid-season break, Liverpool have been hit by serious injuries to a trio of key players - England midfielder Fara Williams, Nigeria forward Asisat Oshoala and centre-back Satara Murray. However, Bonner says Liverpool's squad will be big enough to cope with the absences when they welcome the Vixens to the Select Security Stadium on Saturday. "Bristol will be up for it so it'll make for an exciting game but hopefully we've got enough experience," she said. "We're going to go out to win the game, prepare like we can and we should come away with the points that we want."